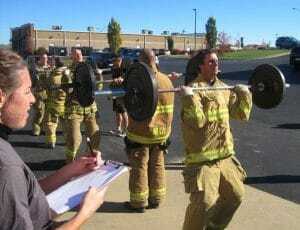 Firefighter Fitness- Is CrossFit it? After reading the comments and getting responses to my posts about p90X, I decided it would be a perfect time to dissect the CrossFit fad that is popular in firehouses around the country. I’ve worked in the fitness industry for over 20 years and have seen a lot of “fads” come and go. Not to age myself but when I started in the industry step classes, leotards and zubaz where still popular. Back in the day every health club focused on having the most updated machinery possible, today you see more minimalistic gyms pop up all the time. Along with these fads have come the “next” best workout program. I remember the day when everyone was “Jazzersizing” or “Sweating to the Oldies” or following the “Body for Life,” program. There were also the days of “Tae-bo”, “Spinning” and who could forget “Fitness made simple”? Some of these fitness fads have come and gone while others are still around. The purpose of this blog is not to judge whether or not CrossFit is right for firefighters (although the title leads you to believe that) but to list the pros and cons of CrossFit to help you decide for yourself. (On a side note, in the following weeks I will be discussing my personal views on this topic, so stay tuned). According to CrossFit’s Foundations page, their program is designed to “optimize physical competence in each of ten recognized fitness domains,” which are: cardiovascular and respiratory endurance, stamina, strength, flexibility, power, speed, coordination, agility, balance, and accuracy. The CrossFit program is designed for universal scalability making it the perfect application for any committed individual regardless of experience. They claim to use the same routines for elderly individuals with heart disease and cage fighters one month out from televised bouts. They scale the load and intensity, not change the programs. CrossFit specializes in not specializing. High Intensity– More and more research studies are showing that short bursts of high intensity exercise is better for you than the typical hour or more long workouts at moderate intensity. CrossFit is all about this. Muscle Confusion– The fact that the workouts vary so greatly from day to day means the body is always guessing and never has the chance to settle into that “workout groove” where it knows what’s coming. CrossFit focuses on maximal strength, muscular endurance, and cardiovascular efficiency all very important components to firefighters. Timed, Efficient Workouts– Most CrossFit workouts are timed, which usually makes the exerciser push themselves harder, hopefully resulting in faster and better results. Plus, moving quickly in between sets keeps the heart rate elevated, burns more calories and helps improve recovery time. 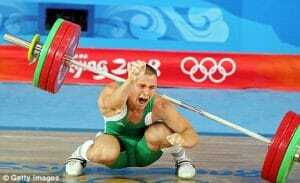 Workouts Focus on Compound Movements and Olympic Style Lifting – This is great because it’s how people get the most bang for their buck with their exercise. The more major muscles you use in a given movement, the calories you’ll burn. Period. Embrace Competition – This may be a “con” for some but the ideas here is that you should compete with yourself to constantly improve. I also believe that the competitive environment of CrossFit may bring out greater performances in people. Comradery– This may also be a con for some. If you are working out at a CrossFit gym you will be paired up with people during some exercises. You are in a class environment, which leaves plenty of room to meet and interact with new people that share a similar interest and goal. I know that this is not a complete list of pros for CrossFit, please comment below and let me know what I’ve missed. So now that you have seen the pros, lets look at the other side of things (read these carefully). The Cons of CrossFit for firefighter fitness. If you have not signed up for my subscriber list.…you are missing out. Sign up today and receive my FREE Reports, the 10 Best Exercises for Firefighters and the 5 Worst Exercises for Firefighters..